Executive Game Producer Greg Donovan (Agents of Mayhem, Saints Row, Red Faction) joins us at the D3 bar! Ever wonder what people do who have film degrees but want a steady-ish job with a reasonable paycheck? They go make video games! 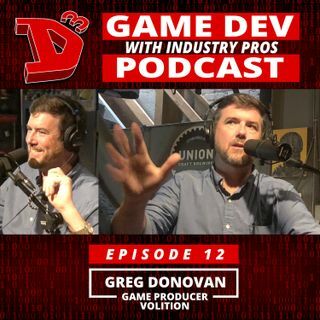 Greg Donovan started out getting his Master's Degree in Film Production but ended up as a Producer for THQ in the late 90's. Since then he has clawed his way up to the Executive Producer spot at Volition in Champaign, Illinois having a hand in almost ... See More everything that came out of that studio in the last 14 years. Ever heard of Agents of Mayhem? Saints Row? Red Faction? Yeah, he was there for that. Can Greg finally answer the age-old question of what in the hell a Producer actually does? Does he remember how to speak English after 14 years in Champaign, Illinois? Crack open your beer and join us to find out!